If you dual boot your Windows PC with OS X or Linux, you may have experienced a problem in which your clocks reset themselves incorrectly every time you boot into Windows. Here's a simple registry edit to fix that.Essentially, the incorrect clock setting happens because OS X and Linux use GMT time while Windows tries to synchronize with your local time zone, getting confused when you reboot between the two. Apple's own Boot Camp drivers for Windows are supposed to fix this problem, though some users have noticed that it still happens even with the drivers installed, and some Linux users are left out in the cold. Furthermore, if you have a Hackintosh, you can't install the Boot Camp drivers, so you'll need to find another way around the problem. To fix it, just hit Start and type regedit.exe in the search box. Hit Enter and navigate to HKEY_LOCAL_MACHINE\SYSTEM\CurrentControlSet\Control\TimeZoneInformation. Right click anywhere in the right pane and hit New > DWORD (32-bit) Value. Name it RealTimeIsUniversal, then double click on it and give it a value of 1. 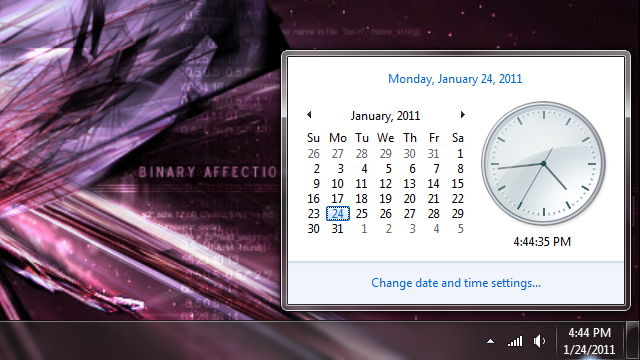 The next time you reboot from OS X into Windows, you should notice that your clock actually displays the correct time.